The Line King – Hey, Look! A Writer Fellow! Hey, I got an idea! Let’s watch something lousy! One time while babysitting my sister’s three kids, I got talked into watching The Lion King 1½. I’m not sure how those little buggers pulled this negotiation off, but they did and I wasn’t happy about it. But I stifled my kneejerk grumpiness and settled in. I reminded myself that the movie is for children, not for me. It was time to be a Good Uncle. So I sat and carefully watched the film, knowing all too well that the kids would quiz me later. And I was right. They did quiz me – just not in the way I expected. 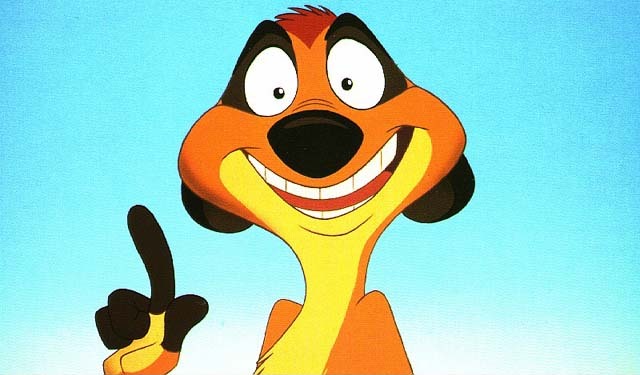 In one early scene, Timon the meerkat (voiced by Nathan Lane) tells his dad (voiced by Jerry Stiller) that he is leaving the meerkat colony. In response, Jerry Stiller – in that wonderful Jerry Stiller-like way – got emotional. He ranted, he raved, he howled to the heavens. 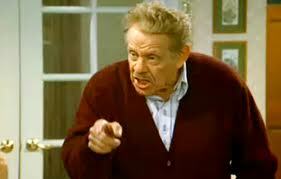 In a flash, my mind leapt to all of Stiller’s great scenes as George’s dad on Seinfeld. The cartoon wasn’t entertaining me, exactly, but I was pleased that it had triggered an entertaining memory. I was quite a sight. After I finally composed myself, I looked up to see all three of my charges staring at me with furrowed eyebrows. “What is so funny?” Lauren, the middle child, asked. She was irritated by my amusement. I did, and I was grateful. At the kids’ urging, I paused the video to explain the joke. I explained how the cheap seats for a play are far from the stage. I explained how an actor needed to unnaturally emote to get his point across to those folks way back there. On it went. My remarks led to more questions, which I answered as best I could. It turned out to be a very lovely chat. Now I was doubly grateful: first, for the good joke, and second, for the thoughtful conversation the good joke spawned. I had also learned a lesson; I will never again so quickly pooh-pooh another cheap-Disney-direct-to-DVD-sequel-cash-in. Hold on. Disney made a movie called Cinderella II? Oh, I am going to murder someone. Now let me open up the comments section by posing this question: What is your favorite “grownup” reference in a children’s movie? This is a great post because firstly, it mentions SEINFELD (not a day goes by that my husband and I DON’T quote Seinfeld), and secondly, it teaches something every writer for children should know: to stick a joke or two in there for mom and dad. They need the comic relief. If mom and dad like the joke, it’s sure to be read multiple nights without objection! There are so many adult jokes in kids’ movies. Like the recent Muppet movie when Walter talks all 1940’s film noir villain and Amy Adams says, “Do people even talk like that anymore?” Or, when during an episode of The Muppet Show, Kermit is drinking a glass of milk with a straw, and the milk in the glass is actually slowly disappearing. Kermit looks straight at the camera and says, “Think about this for a minute, folks.” Some of the lines for adults are so sly they are quickly forgotten. I think I need to have a pen and paper handy the next time I watch something with the kiddos. Jim Henson was great at non sequiturs for grownups. But he was even better at crafting jokes that kids and adults could enjoy at the same time. Now, that’s a lost art. You don’t need to get a life, you just need to get fewer sequels. You at least have Tangled, yes? When I’m about to say a naughty word in mixed company, I segue into a discussion about shiitake mushrooms. Awesome! It’s great that you all had a laugh and the kids learnt something. I used to love Hong Kong Fuey lol. 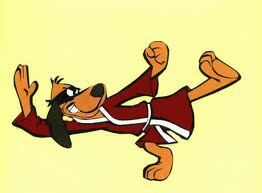 I used to have a Hong Kong Phooey lunchbox. Had I kept it, it could’ve sold for a fortune in the collector’s market. I can only assume the HKP lunchbox collectors have not seen the HKP cartoon lately. That’s why I still love Sesame Street—it’s got stuff for the adults too, and they always work them in so well. I like a lot of the “kids” movies for the same reason. Absolutely! Sesame Street is especially good when it comes to amusing parents. I love watching the show with my little guy. When the kids were little, I loved it when they watched Sesame Street because there was so much adult humor mixed in with the stuff they taught. Like a Bruce Springsteen-esque muppet singing “Baby we were born to ADD.” Brilliant. One of my favorites was when Smokey Robinson appeared on the show to sing “You Really Got A Hold on Me,” while he was being assaulted by alarmingly persistent letter U.
I forgot about that one. Priceless! Hahah Lion King 1 1/2. So desperate! Why can’t they just leave a good thing alone? I watched a bit of The Little Mermaid 2, with Ariel’s daughter. Super weird. I just…can’t. I can’t either. But sometimes the little buggers make you! This was great! Thank you for this. My memory retention being what it is, I can’t bring any lines to mind, although I know there have been quite a few over the 25 years I’ve been raising kids. Lately I’ve had Toddler/Pre-school tv on…ALL THE TIME…at least it seems that way. One of the things that I’ve realized is that just about every one my 3 1/2 year old likes teaches something that we adults often forget: whether it’s about manners, how to handle our feelings, or deal with the feelings of others. A case in point is the My Little Pony: Friendship is Magic that plays on HUB tv. Let me tell you, Pinkie Pie is IRRITATING! However, one day I found myself with my jaw hitting the floor because there was a scene with the ponies chasing around and flying about and the music called to mind old Benny Hill episodes I experienced living with my uncle while I was growing up. At first I was a little appalled, but then I realized it wasn’t anything the kids would know about and I just enjoyed the humor of it. Glad you liked it, Kina! My son used to be a fan of Wonderpets, a show which would occasionally throw in a reference for the parents. I can’t remember the exact context, but I do recall Linney the guinea pig suddenly starring in a preschool version of Sergio Leone spaghetti western. As an old folk, I concur. I will remember your advice….and you should remember this advice. Don’t let them talk you into watching Aladdin III. Yes, III. When she uttered that line, I remember thinking, “Hey, she wouldn’t be tramping at all if you didn’t give her feet!” My mind works that way sometimes. As a [very] long-time animation fan, I thought “Beauty And The Beast” was the first animated movie to deftly appeal to children and adults alike. I also enjoyed “Shrek” very much and, always, any Muppets movies. They’ve always been brilliant! Beauty and the Beast is one of the greats. It was a family film in the truest sense of the term; everyone in the entire family could watch it AND enjoy it. No easy feat. Disney’s Tangled captured that same spirit, I think, as did many of the iconic classics such as Snow White and Dumbo. As to the question, “Is 1776 my all-time favorite musical?” I shall abstain. Like a true New Yorker! It’s not a line that resonates so much with me, it’s a character. Specifically the Edith Head knock-off, Edna Mode, in “The Incredibles”. That was inspired! Fun post! I don’t think there is a thing about The Incredibles that I don’t enjoy. Fun fact: Rick Dicker, the bureaucrat who relocates Supers, is voiced Bud Luckey a Pixar animator. Luckey is also the voice of Eeyore in last year’s Winnie the Pooh – which was a darn good movie, by the way. I didn’t know that! Hey, do you know that Brad Bird voiced Edna? Oh, yes. You’d have to get up pretty early in the morning to stump me with animation trivia. You’re in luck. I’m a night owl. What a great story. I remember reading the daily comics and asking my mom why some were funny, and like you with the kids, she explained it to me. Thanks for stopping by and liking my post! It’s funny you mention that! My little guy pulled out an old Bloom County book the other day and asked me to explain a few of the 1980s references. Have you ever tried to explain Tammy Faye Baker to a six-year-old? Not recommended. I hate hate hate hate haaate cartoons. HATE ’em. I know you’re talking about movies, but it reminded me of cartoons. And I hate them. And I don’t understand why children like them so much. Half the jokes go way over their heads. A lot of them are actually quite inappropriate. It annoys me. My children are going to be annoooyed with me as I handpick the cartoons they may watch. Muahahahhahaahhaahaaaaaaa. Jiminy Crickets, I did not expect my post to inspire such passion! But I welcome it! There are some wonderful cartoons out there, Lovely — but like most wonderful things, they aren’t always that easy to find among the dreck. Dreck is easy to crank out so there’s gonna be a lot of it. And Lordy, you’re right; most of that dreck is inappropriate in the extreme. Kids will find cartoons with or without you, so my goal has always been to introduce my son to the cream of the cartoon crop before he can decide that this era’s Hong Kong Phooey is all that and a bag of chips. I always watch these good cartoons with him and it’s always a lot of fun. But I do understand your point. My wife understands it as well. When I toss a Warner Bros. DVD in the machine, she suddenly decides to do something on the other side of the house. Shrek is always a good one! And Edna Mode in The Incredibles – an absolute classic. A sequel to The Incredibes is probably the only sequel I would ever welcome with open arms. Bring it, Brad Bird. C’mon now! I’m thinking that most Pixar films have loads of adult “sneak” lines that make the film less painful. I can’t think of any specific lines at the moment, but I think it works for kids’ picture books, too. Throw the adult who’s reading the book to a child a few bones, and more than likely they’ll want to read the book to the child again. Ms. Hoffmann! Welcome back to Blogland! How was your vacation? Pura Vida! Am headed with my son tomorrow to the equally exotic land of Lincoln. We will be visiting my family, including a trip to the Illinois State Fair. Can’t wait to get another look at the butter cow. Hope the AC is working there, otherwise, the cow will be a pool of rancid yellow liquid. Will be posting details of our travels in Costa Rica once we we’re back in SF for the Fall school session. Hope all is well with you and yours! In the meantime, Pura Vida! Take a pic of the butter cow (or butter puddle) for me!